YouTube to pay for "new content from some of our top creators." Twitpic is purchased. These stories, and more, in today's Morning Social Media Newsfeed. YouTube has a wealth of homegrown talent — and it wants to keep it that way. The video platform said Thursday it will invest in the creative types who have risen to Internet stardom on YouTube. CNET “Now, we feel the time is right to make another important investment in our creators,” Alex Carloss, head of YouTube original content, said in a blog post. “That’s why we’ve decided to fund new content from some of our top creators, helping them not only fulfill their creative ambitions but also deliver new material to their millions of fans on YouTube.” Re/code Video producers and distributors who are discussing deals with YouTube executives say the site is talking about investing in different kinds of formats and different lengths; in some cases, YouTube is talking about pairing talent with more traditional Hollywood producers. The one constant is that they want to work with talent that is already popular on YouTube, like fashion star Bethany Mota. The Guardian The vast majority of popular YouTube stars are signed to MCNs like Maker Studios and Fullscreen, but the offer of funding and promotion from YouTube itself could be an incentive for their biggest stars to consider going it alone. 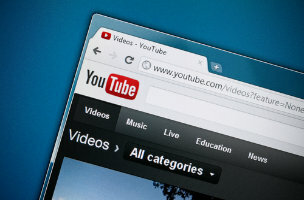 Recent analysis by The Guardian of monthly YouTube charts produced by analytics firm OpenSlate and industry site Tubefilter revealed that the monthly view count for the top 100 YouTube channels has grown by 80.5 percent over the last year. The Next Web In related news, YouTube has added new real-time reporting to its analytics dashboard that provides view counts down to the minute for your videos. By default, the new dashboard section shows your last five published videos, but you can search for older videos. Despite the growth of social media marketing, CMOs still have some questions. Social has the potential to connect brands with consumers the world over, but only for those who understand how to use the medium. An infographic from marketing automation provider OutMarket shows us both the good and the bad of social marketing. Twitter on Thursday gave its user profiles a facelift for the iPhone, packing them with more information about users and making it easier to discover what they’ve posted. Timed with the release of Apple’s iOS 8 software, the redesigned profiles now look more like the desktop pages, which got a colorful makeover in April. The Scottish referendum has done more to re-engage a generation in politics than any hand-wringing MP or crusading campaigner. So who won the social media wars – and what can we learn from it? The simple answer is: the Yes campaign was victorious.